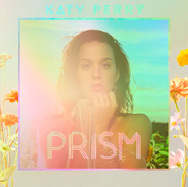 Prism es el título del tercer disco de Katy Perry. Como primer single, Roar, un tema compuesto por ella misma en colaboración con Bonnie McKee, y producido por Max Martin y Dr. Luke. Vuelve a contar con la participación del productor Greg Wells. La portada del disco es obra de Ryan McGinley. A slow, groovy song. Sample lyrics: "Say my name like a scripture, Keep my heart beating like a drum, Legendary lovers, legendary lovers, legendary lovers". There's a breakdown in the song that makes you want to belly dance. There's a howl toward the end… "Ah-who-o-o-o!" Katy shared that it's an upbeat "song that Mariah Carey would have put on her first record". Sample lyrics: "I'll give you a taste, Make you lick your body every day, Give you something to satisfy… Give you something good to celebrate, I know you like it sweet/ Make it like your birthday everyday". The breakdown: "Let me get you in your birthday suit". Song ends with a whisper, "happy birthday". Recorded in Stockholm, produced by Klas Åhlund. She was inspired by a "Central Park Day" where she was eating hot dogs with a friend and watching roller skaters perform to deep house music. Very 90's dance divas a la CeCe Peniston and Crystal Waters. Sample lyrics: "Just when I think I can't take anymore, We go deeper and hotter than ever before, We go higher and higher, I feel like I'm already there, I'm walking on air tonight"
The urban song has Juicy rapping "She's a beast" of Katy. Elements of trap. Sample lyrics: "So you wanna play with magic, Boy you should know what you're falling for, Baby do you dare to do this, Cause I'm coming at you like a dark horse.. Are you ready for, ready for, Perfect storm, perfect storm, Cuz once you're mine, once you're mine". Produced by Dr. Luke and Circut, additional: Max Martin. Co-written by Perry and Sarah Hudson. Has a spoken word break. Club banger written in Stockholm. Sample lyrics: "Chanel this, Chanel that, hell yeah… Street stuntin' ya we do it like that, Yeah this is how we do.. Bring the beat back"
written for her BFF Mia, a traveling DJ. Pretty '80s. Upbeat, dancey song written for her DJ BFF Mia Moretti. Katy shared, "She travels all around the world. She's my muse. Don't tell my other friends". Sample lyrics: "That girl's a trip, one way ticket, Takes you miles high, cause she's got that one international smile"
It's about an ex who's not in her life anymore. It's world-weary & resigned. Mid-tempo song written in Santa Barbara. Sample lyrics: "Every gift, every letter, every promise, there forever… now you're just a ghost.. vanish like a vapor… now I see clearly… my vision's 20/20… So rest in peace, see you on the other side". Uplifting dance song about getting away from a toxic lover. Made in Stockholm and produced by Bloodshy. Katy has wanted to work with him every since Britney Spears‘ "Toxic". "All the lyrics are important to me", she shared. Sample lyrics: "I love myself in fear of losing you… I lost my own identity"… Love me, no more second guessing/ There's no more questioning/ I'll be the one to find who I love/ I can see you have feelings… I'm gonna love"
Last song on the LP, co-written by Greg Wells. Piano ballad about being grateful & loving yourself. Least produced song. This ballad closes out the regular record. Sample lyrics: "Lay on the bathroom floor, Couldn't take it anymore… By the grace of God, I looked in the mirror and decided to stay, Wasn't gonna let love take me out… I thank my sister for keeping my head above the water… Every morning, I finally see myself again… Universe calling my bluff"
Hola Nicki!. No se si deberíamos, pero lo hemos hecho. Saludos!.